Our attempt to sail a bit low and fast to take advantage of what was forecast for the winds so we might swing around to the SW, has been abandoned. The newest forecast has the winds staying out of the NW. Opportunities to make up ground from here will be minimal in this straight to the barn jib reaching. I don’t know if the tracker shows it, but the last 24 hours of as sailing has been fast and awesome, sustained rides over 20 knots have been commonplace. Now after being out here for our 9th day, the learning curve for crew and boat has been steep, and we wish we had had a mentor willing to go through the various systems to refine them and make them offshore worthy. From stacking systems to long spoons for the freeze-dried food, from sail changes to water removal, everything will be looked at from a new perspective. The results of the Atlantic cup had our expectations high. The reality is that we’re 5K runners moving up to marathon distance. We’ve learned tons and are getting Bo Dream prepared for its ultimate goal of Dave’s circumnavigation. I would love some strawberry rhubarb pie right now. Dave wants scallop shrimp ceviche, Mark wants Chinese food and a whole chicken and Emma wants a guava off Drew’s mom’s tree. Right now, Bodacious Dream is smack in the middle of its maiden race across the big pond. 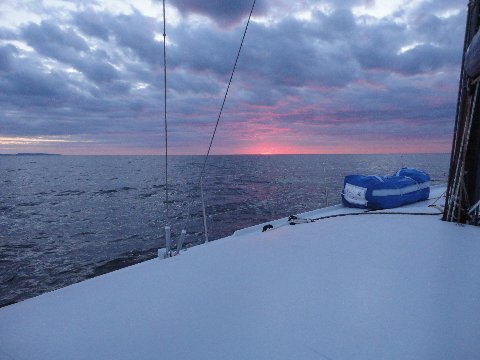 On Sunday July 22nd, Dave and the Bodacious Dream crew (Matt Scharl, Emma Creighton and Mark Zaranski) along with 19 other Class 40 competitors, left Quebec, Canada on their way to St-Malo, France. The race is appropriately called Québec Saint-Malo and it covers a distance of 2,897 nautical miles, or 5,365 kilometers. The first Transat Québec Saint-Malo in 1984 marked the 450th anniversary of explorer Jacques Cartier’s first voyage from Saint-Malo to the Gulf of St. Lawrence in 1534. Every four years since then, the Transat Québec Saint-Malo has brought together the best professional monohull and multihull ocean racers around for an epic Atlantic crossing. One of the classic offshore yacht races, the Transat Québec Saint-Malo is the only continuous west-to-east offshore crewed race in the world – and Bodacious Dream is the FIRST American crew to ever compete in the race. The boats first have to navigate their way down the St. Lawrence River. The river can be narrow in places, and with its islands, reef and sandbars, the technically challenging 400 nautical mile stretch can be full of surprises. What’s more, the skippers have others in their line of sight, which is not always the case during the true offshore part of race. Strategy and tactics play a key role here. To learn more.. The Québec Saint-Malo website is here. And you can track the standings here. Here’s a shot taken at the start of the race.. Bodacious Dream is on the left. In the week that the gang has been on the water, somehow in the midst of getting pounded by huge waves and high winds, they’ve been sending updates via a satellite connection, which we have posted and will continue to post on both the Bodacious Dream Website BLOG and on our Bodacious Dream Facebook page. Catch up on the wet and stormy week that was.. And tune in to the week to come. A note from Matt, delayed from Saturday.. The sky and the water is gray with cloud cover and a light rain every so often, good wind and Bo Dream is pointing east. We hit something like a log or palette last night. All I know is, it was hard. We hit it, drug it for about 10 seconds and it slipped off the back only hitting the keel and not the rudders. Doesn’t seem to have done anything bad – just a sudden bolt to wake you up. The only life out here are birds. One is called a Storm Petral and not sure of the other. They fly around behind the boat, though haven’t seen any of them catch anything or stop to land. Seems like a tough way to make a living. Would like to get back the decision to gybe north yesterday morning, as it doesn’t seem to have helped us at this point. I would guess many of you were wondering why we would do that, as you can see the wind has slowly shifted from 330 degrees to 180. Being on the inside of a header is great, but the extra distance to get there doesn’t appear to be worth it. Again I need to continue to remind myself that this is a long race, and there will be multiple systems to deal with – not just a shift and your dealing with the Manitu Islands. Well, we’re going strong now and Bo seems to really like jib reaching. so it’s time for her to make up for my mistakes. Hope you’re all having as great a time as we are.. so how does damp, tired, and 2200 miles till we see land become a great time? Well, for Matt, Mark and I, this will be our first Atlantic crossing and that keep us moving!! This is Emma’s second – her first one was on her mini-a 21 foot class of solo sailors!! You can imagine how her energy keeps us all going. I’m curious how its going to feel the last day or so coming into European waters and nearing the end of this race. Matt’s written you much about life onboard. Pretty clear perspective though maybe a bit understated. Dampness is everywhere and the engine charging hours are a clamor to lay as much wet clothing on or around it to get it dry again. The racing has been great. These competitors are really tenacious. We’ve been through our ups and downs and have been able to move ahead, as we continue to look for opportunities to climb up the standings even more. The boat’s taken a lot of punishment the last 5 days and I’m happy to say we’ve only broken a few things…a boom vang line, an inexpensive harken shackle and few other very minor things. I’m sure we could have broken much more if we didn’t have such a top crew onboard when we got the boat racing along at 23 knots with water everywhere and wind increasing, as Matt told you, taking down the spinnaker….whew….could have been ugly if it weren’t for the band – Matt on point, Emma on the helm and Z on the “piano” (the pit where all the lines come into 16 jammers). So hang in there….more to come soon. Sorry it’s been a day or so since I’ve been able to get out an email. The last 36 hours have been busy and wet. Started out yesterday (Thursday) early morning 4am’ish coming out on watch to rain, 15 knot winds and thick fog – terrible driving conditions and for the most part the only thing happy were the birds flying around. Then later that morning came strong winds and 6-8 foot seas that resembled a washing machine. This was most uncomfortable for about 5 hours. The wind then picked up and with spinnaker flying, we were finally moving well again, so well that we had to switch to the reaching kite and were off in 30 knots of breeze, heading straight for the Saint-Pierre Island which we had to round at 20+ boat speed. Getting to the island, the wind lightened and we went forward to a jib reach were we were greeted with mild conditions and about 5 hours of flat seas – not to mention the sight of Mare, EDF and Jack in the Box. We haven’t been able to get position reports, so seeing them brightened our spirits, cause as any sailor will tell you when you’re floundering around just trying to keep the boat moving, you can’t help think everyone else is leaving you in the dust. After the island and with the spinnaker flying, dusk soon approached and along with a sudden increase in wind speed up to 35 knots, the A4 kite that we were flying, is as the book would say – good up to 24 knots. We were overpowered and doing everything we could to keep the boat under the kite, and not wipe out. Emma did an awesome job of keeping the worst from happening, while somewhere in the process, hitting 23 knots of boat speed. With Dave and I on the bow, it took everything we had to get the spinnaker snuffed and down, which we did with no issue other than my memory of those set-to-failure workouts we used to do at Michigan, that until you were really used to them would drive you to the locker room puking your brains out from exhaustion. That was me 5 minutes afterwards – but in general now, feeling just fine. We throttled back some last night in order to recharge our personal batteries and recover from the hardest 600 miles any of us had ever sailed, mentally and physically. We’re now sailing under the A4 downwind spinnaker in sunny 65 degree temperatures and 15- 18 knots of wind. What a difference a day makes. There’s not another boat in sight. We know we lost some distance, but are confident we’ll make it back now that we can let Bo Dream run. We know she’s fast. Tactically up until now, this has been a lot like the long distance races we do in the Great Lakes, 50 to 300 mile legs where you have to pick a side, deal with one wind change or weather system. Now with 2300 miles in front of us, this is a new game tactically. Long term decisions aside, for now we’ll be sailing mostly a rum line course, in beautiful sailing conditions. Delayed post from Matt Scharl on Wednesday, July 25th..
Hello from the St. Lawrence Bay. What a difference a day makes. We’ve had now 10 hours of the same conditions, NNW wind 18 to 25 knots, 10 to 17 knots of boat speed in the direction we want to go. i can’t see the tracker, but if it shows much detail at all, you can see how many different times we’ve had to make course adjustments. Many of those adjustments or sail changes come during light winds where you’ll see a track that has no rhyme or reason other than the desire to get further down the course. With those changes come the obvious sail changes, but what you don’t see is the moving of what is called the “stack.” This stack consists of all the sails not being used, unbolted down gear, personal gear, food bins and the required water on board 30 some one- gallon jugs. So when the boat changes direction or the wind changes, we adjust sails and then adjust the stack, the stack goes to the front, heavy in the back, from the port side it goes to the left and so on until the boat is happy. This stack moving gets old really fast in the variable conditions. We have to really thank Emma for keeping us all in line with this, her diligences regarding this is spectacular. Conditions on board are good, some of the dampness has gone away except for the floor, where the only time my feet are happy is in my boots where its dry. We’re catching up on sleep and overall the happiness meter is on the rise. Having boats nearby to race is great and the occasional dolphin riding our wake is awesome. The sun is shinning for the first time today, but the wind is also dropping; wind=wet and cold, sun=warm and light wind. Living conditions below are damp, think about what it feels like after an entire family has taken a shower, everything has a light coating of dew on it. Tonight looks to be a pretty cold night to come, with the cloud cover clearing and and water temps in the low 50′s. Unfortunately, we’ve been playing Murphy’s Law decision-making for a while, and losing ground quickly, but we’ve managed to make up a lot of it over the last 24 hours, at the expense of sleep so I’m going to try to get a little while I can. We’re beginning day two here. The first day was a full one with southerly breezes starting about 10 knots at the start and building through the day to 25. Quite a day of gybing down the race course!! As night came to us, the winds went light and the challenges began. Picking our way thru navigation, tidal currents and holes in the wind made for some frustrating sailing. We’ve managed at this point to round the mark at Roumiski. Coming to the mark we had less than two knots of wind and as we rounded, we were gifted with five knots…..we’re moving now and hoping to make some ground up from those that got past us last night. Sailing in the peaceful calm last night gave us some interesting experiences. While picking up zephyrs of breeze, we could hear whales sounding around us. We’ve sighted a couple so far—one Beluga. The other wonderful sound that brings back many memories is the lonely cry of the Northern Loon. Throughout the night and early morning hours, on occasion, one would cry out. That and the occasional pine-scented zephyr from shore, let us know we were sailing thru some beautiful wilderness.night. It’s the night before the race and all is well. Bodacious Dream is in great shape for the race thanks to huge efforts from Emma, Matt and Mark. It’s an amazing process that’s hard to explain, but there are various levels of checks and safety checks, loading of water and food, packing and planning…. and then the meetings and events…. all of which are in French, which makes it extra hard to get all the details down….especially for such a detail-orientated guy!! The actual start is 11:20 EST on Sunday the 22nd, but we’ll be leaving the harbor by 8:45 or thereabouts and do a tour up the river to the starting area. Once the start goes off, we point the boat to the North East and head for open water…..but wait, not so fast. There’s about 400 miles of the St. Lawrence to traverse first before we get into the Atlantic and to make things interesting, there are a number of buoys that we have to round on our way there. This adds excitement to the harbors along the way as the boat come close off their harbors and sail past. There’s a great group of competitors here and there is a chance that any number of boats could have a great race. I expect lots of lead changes and interesting tactics for the first three or four days after we get out of the river. In the meantime, to satisfy some visual desires, here’s a photo of one of the spectacular sunsets we saw on our way up here a week ago. The sun broke through at the horizon and lit up the underside of the clouds as we moved along into the night. Sometimes these things just take your breath away, and you forget all the trivial things about life and realize how rich and beautiful the world is. Hope you’re all having a good summer. The Chicago Mackinac Race started Sunday and all our cohorts are on “Bodacious IV” working their way up the late. Check in on them too and see how they are doing. So stay tuned. We hope to get into a regular rhythm sending out an email post every other day. Check onto the website www.bodaciousdream.com. We will be putting the news up there with some regularity as well as our Facebook page. Thanks to everyone for making this a wonderful experience. I was fortunate to have good friend and fellow sailor, Kevin Finnegan along on the trip—not only helping out with the work of sailing the boat, but manning the binoculars keeping a watch out for whales, boats and other interesting events along the way. We left Newport on July 4th in the afternoon, a few hours later than we’d planned, but if I were smart, I’d have waited a few more hours and it would have been a convincing argument that the July 4th celebration and fireworks were a sendoff for us!! Very gentle breezes gave us a chance to catch our breath as we motor/sailed to Halifax where we cleared customs, refueled the boat and spent a night. From Halifax, you continue east for a hundred miles and then transit the Canso Cut which saves quite a trip around the eastern tip of Nova Scotia. We made a stop there for just a few hours before heading thru the locks and into the outer reaches of the Gulf of St. Lawrence. With Kevin on the binoculars, we spotted our first whale!! Locals told us to keep a close eye out for Whales as we entered the Gulf and we weren’t’ disappointed!! A great night and following day of sailing got us up around the tip of Gaspe and into Riviera du Renard where we met up with fellow Class 40, Red. We stayed in R du R for a couple of days to wait out bad weather and winds before making the last 350 mile trip to Quebec City. The trip to Quebec City brought us all sorts of sighting of wildlife, many birds, seals, whales and most exciting was the pod of Beluga Whales that seemed to swim around us as we passed thru their territory off Touldasac. Quite a thrill!! It’s very busy in Quebec City these days. Kevin left for home yesterday as Emma Creighton arrived. Matt Scharl and Mark Zaranski arrived today and we’ll be a full, four crew strong as we continue to prepare and set up the boat for the race. There seems to be a constant stream of papers and forms to fill out, a list of safety items to locate and purchase, boat repairs and maintenance to do all while meeting and greeting old friends, new friends and the many press people around. When you get the chance, check out the website www.transatquebecstmalo.com for the race and get your pointers set to the race tracking. This promises to be an interesting and exciting event to follow. There are 21 Class 40 boats in the race, all of which are crewed by top level, international sailors so we’re expecting the competition to be very close and with the currents, winds and interesting navigation challenges of the St. Lawrence, you’re likely to see the lead change many times before we even get to the Atlantic and the crossing to France. Stay tuned, we’ll have more updates as the start gets closer and we are planning on sending along updates from out on the race course. This will be our first attempt at bringing you right onboard the boat as we are racing.